Fans of artist Peter Helck will have an opportunity to purchase a Vanderbilt Cup Race painting next month. But, it is going to cost you. The painting "Willie K's Tour of Inspection" will be auctioned at RM/Sotheby's "Driven by Disruption " auction on December 10, 2015 in New York City. Note: An expert in Peter Helck's work has informed me that this painting is actually "tempera on illustration board" not "oil on canvas" as promoted by the auction house. 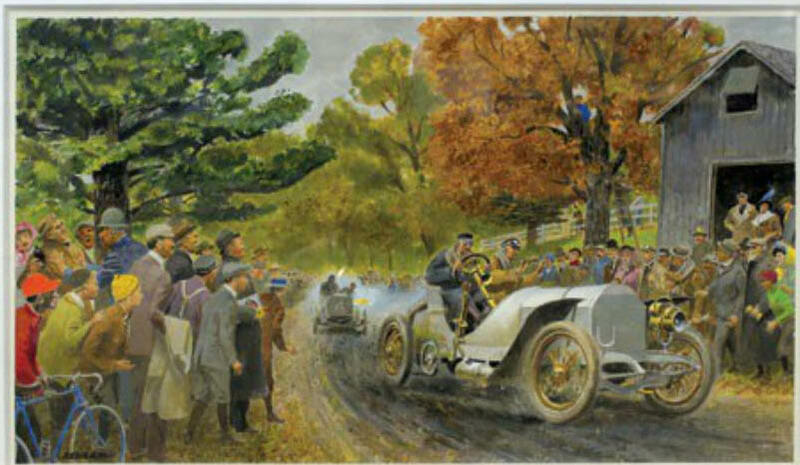 The painting commissioned in 1977 by Richard Roy depicts William K. Vanderbilt Jr. inspecting the course during the 1906 Vanderbilt Cup Race. As shown in the below photos, Willie K. would regularly jump into his Mercedes and check out the courses during the races. The painting is being offered without reserve with an estimated sales price of $30,000 to $40,000. Update December 11, 2015: The painting sold for $48,875. Framed painting: oil on canvas, 40 in. x 27 in. Framed sketch: casein, ink, pen, and pencil on paper, 20 in. x 16 in. Two sketches: pencil on paper, 14 in. x 9.5 in. Richard Roy met Peter Helck through their mutual friend, Jim Carpenter, around 1965, when Roy was trying to trace the provenance of an unusual Mercedes bronze. Shortly thereafter, Roy commissioned the first of what would be 11 oil paintings until the time of Helck’s death in 1988. 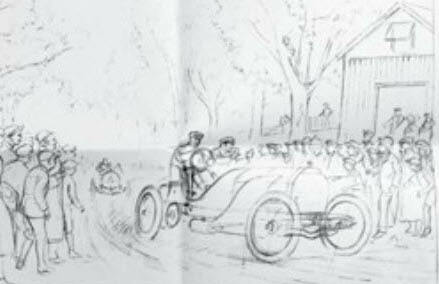 Peter Helck is best remembered for his painted pictures of automobile races. Having been an avid fan of the sport since childhood and a regular attendee well into adulthood, these beautiful works of art were often constructed from Helck’s personal memories and recollections. He knew drivers from Louis Wagner to Mario Andretti, and his paintings documented their exploits as none had before. Offered here as a single lot is a collection of original pieces by the renowned American automotive illustrator. The work was commissioned by Roy in 1977 and includes a framed color sketch, two pencil sketches, and a framed oil painting completed in 1980. 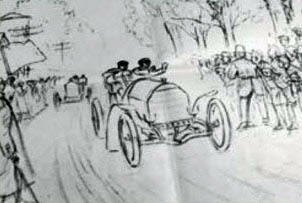 The painting, titled Willie K’s Tour of Inspection, depicts William K. Vanderbilt Jr. at the 1906 Vanderbilt Cup race. 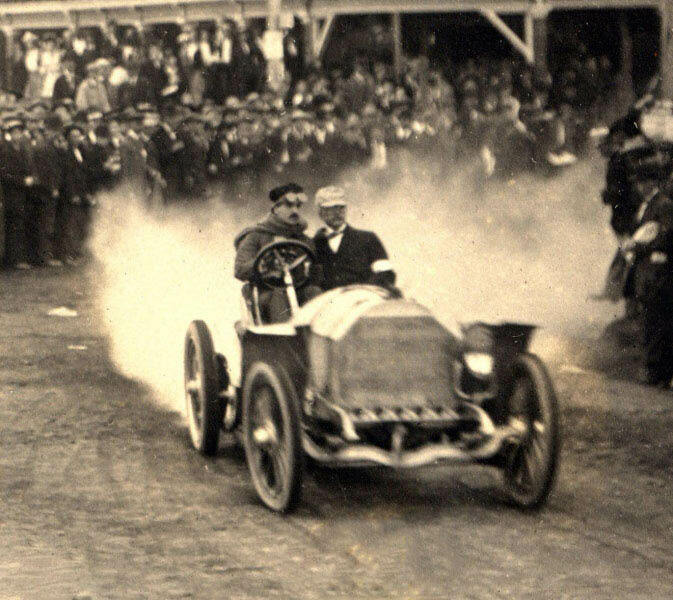 Vanderbilt is seen inspecting the course after Joe Tracy complained that crowds were getting too close. 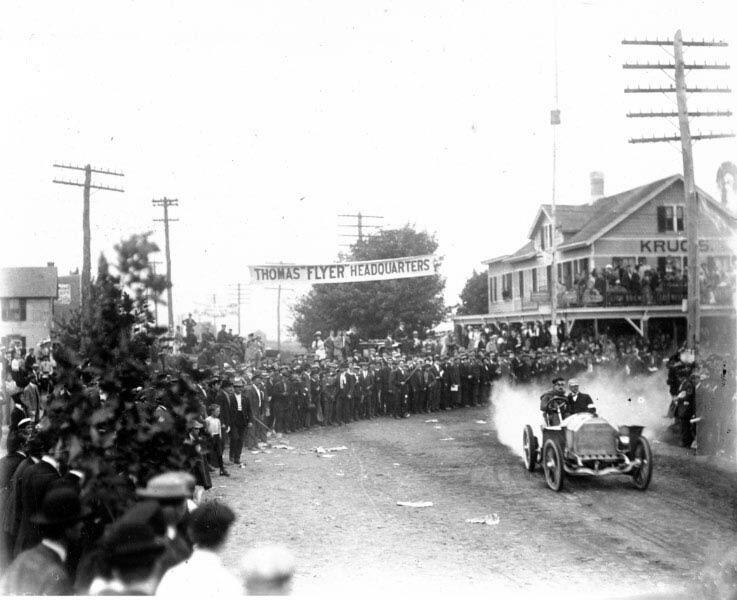 The entire scene was based on Helck’s personal recollections, as he attended the race as a young man. Of the 11 pieces that Roy commissioned from Helck, this particular example serves as the final installment. Unlike the other paintings, Roy retained Helck’s pencil sketches depicting alternate versions of the final image. This is also the only oil painting created for Roy where Helck is known to have created a color sketch. Original letters from Helck documenting the creation of the work are also included. As rare and insightful pieces of automotive history presented in excellent condition, these works of art would be a wonderful addition to any collection. Willie K. in his Mercedes with Dr. Louis Lanehart on the course at Krug's Corner in Mineola. I have always admired the work of Peter Helck and suspect this painting will fetch far more at auction. The letters and sketches included with the painting make this offering quite unique. I wish there was a way that I could find out which “unusual Mercedes bronze” they are referring to. Why not go for it Howard,something else to add to your collection of memorabilia?